Ensaymada is the Filipino version of the Spanish Ensaimada, a pastry distinguished by its use of pork lard. 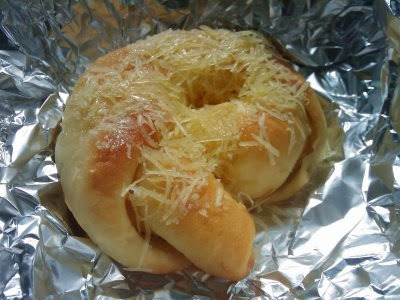 Instead of using lard the Filipino Ensaymada substitutes butter and adds aged Edam cheese as a final touch. 1. Dissolve yeast and sugar in 1 cup lukewarm water. Let it stand for 5-10 minutes to grow. Add ½ cup butter, sugar, salt and scalded milk. Add the beaten egg yolks. 2. Beat in flour and knead until smooth and elastic. (You can throw the dough onto a lightly floured surface as part of your kneading). 3. Form into a smooth ball, place on lightly greased bowl, flip over so top is oiled, cover with dry cloth and let rise until double in bulk. Cut dough into half and form 12 balls from each half to make a dozen. 4. Roll each ball real thin, brush with softened butter, dust with grated cheese, roll with the help or a thin skewer and form into rings right onto slightly greased sheets. 5. Cover lightly with cloth and let rise until triple in bulk. 6. Preheat oven to 400°F while dough is rising. Bake about 15 minutes. Brush tops with butter while hot. 7. Let cool, then brush with butter once more and sprinkle with sugar and grated cheese. Wrap individually with greaseproof paper, if desired.